The Mexican wolf (Canis lupus baileyi) is a smaller subspecies of gray wolf, typically about the size of a German shepherd. There were at least 109 wild Mexican wolves, or lobos, in the Southwest in 2014, up from 83 in 2013, U.S. Fish and Wildlife Service (FWS) announced Friday (Feb. 13). It's the fifth year in a row the small population has grown. In 2010, there were just 50 Mexican wolves in the wild. In the 1980s, when wildlife officials were devising ways to reintroduce captive-bred Mexican wolves in the Southwest, their goal was to have 100 individuals in the wild to guard against extinction, said Benjamin Tuggle, the Southwest regional director for FWS. "Until we initiated the first releases in 1998, there had been no Mexican wolves in the wild in the United States since the 1970s," Tuggle said in a statement. "Although there is still much to be done, reaching this milestone is monumental!" Wolf conservation advocates cheered the news, but said there is still more work to be done. "Today is a good day for Mexican gray wolves," Michael Robinson of the Center for Biological Diversity said in a statement last week. "But we're going to keep fighting for an expanded recovery program that follows the science and doesn't short-change these magnificent animals." Earlier this year, FWS officials announced that Mexican wolves would be protected as a subspecies under the Endangered Species Act, separate from gray wolves. The agency also expanded the territory for the population of Mexican wolves and set an objective to boost their numbers to up to 325 individuals. But conservation groups like the Center for Biological Diversity have pointed to a previous study prepared for FWS, which found that 750 Mexican wolves across three sub-populations were necessary to ensure the species survival. Wolf advocates also took issue with the agency's decision to grant permits allowing people and state agencies to kill wolves that prey on livestock or have an "unacceptable impact" to a wild herd of elk, deer or other ungulates. 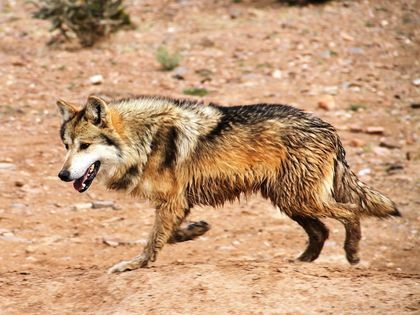 "Allowing Mexican gray wolves to disperse over a broader area is a positive, but that positive is negated by an unfounded population cap and increased authorized killing - neither of which is based in the science that says what's best for lobos," Eva Sargent of Defenders of Wildlife said in a statement last month.